In the past, paper sizes were very different in size. Every papermaker or country used its own favorite specification. That, of course, is not very handy when you send letters to other people or wish to press a stationary. And imagine the many various paper sizes a press company had to have on stock. Over the years people got the idea that a (inter)national standard for papersizes was usefull. The international paper size standard, ISO 216, is based on the German DIN 476 standard for paper sizes. ISO paper sizes are all based on a single aspect ratio of square root of 2. Meaning that when you fold the shortest size you get the next in the series. For example, a folded A4 sheet makes the smaller A5 sheet. Largest paper size, in regular use, is the A0 paper 841 by 1,189 millimetres (33.1 × 46.8 inch). 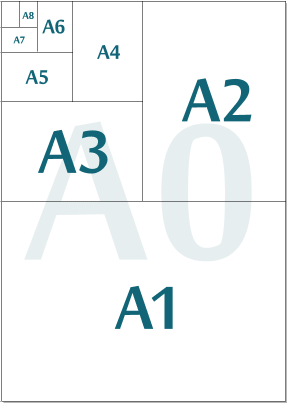 This image shows the various sizes you get when a paper under ISO 216 (A4, A0, etc.) is cut in half along a line parallel to its short side. It results in the smaller sheets having the same ratio as the original sheet. Every smaller DIN sheet is half its parent. The most used paper size in the United States is called the US Letter. It is one of the official north american paper sizes and adopted by the American National Standards Institute (ANSI) in 1995. Just like the ISO 216 series by folding one sheet from the series in half parallel to the shortest side, you get the next size down in the series. The sizes however differ between the both standards.